In this video Marlene Johnson introduces the basic principles of the Third Side. The impacts of conflict are often felt by the wider community. Not just the parties who were directly involved in the conflict themselves, but by others in the community who feel its effects. I’m Marlene, and I’d like to talk with you about that today. I’d like to talk with you about something called the Third Side. The Third Side approach to conflict, which came out of the Harvard Negotiation Project at Harvard. This is a project that seeks to better understand the theory and practice of negotiation as well as conflict resolution by working in real world conflicts. And then spreading the knowledge through writing and teaching. 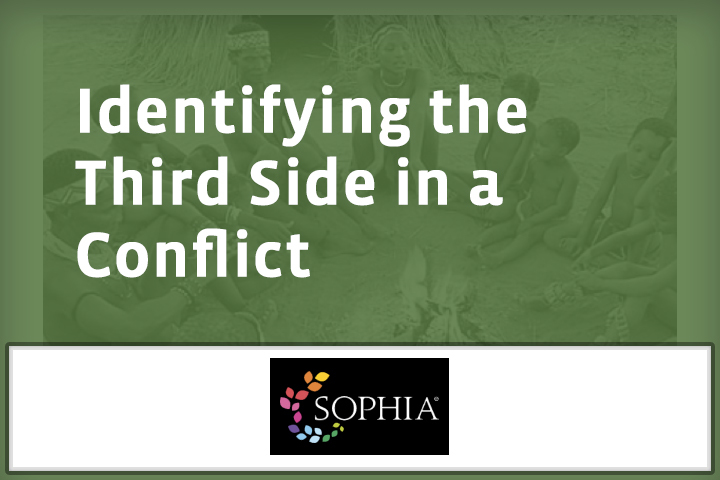 So the Third Side approach comes from their work, and this approach really works to take into consideration the interests and perspectives of everybody in the wider community who may be affected by a conflict. So it’s not just the two parties and their needs, but the needs of the others who are affected by conflict. And they’re actually brought in. Their interest and their influence can help resolve a conflict. So that’s the Third Side approach. Now there are basically three functions within the Third Side approach– conflict containment, resolution, and prevention. And the Third Side has identified 10 different roles that we can play– any of us– who are part of the Third Side. Who are affected by conflict. 10 different roles that we could play, and organize those roles under these three functions– containment, resolution, and prevention. So I have them here behind me, but first of all here is the model of the Third Side. Contain if necessary, resolve if possible, best of all prevent. So the model is organized around these functions. And here are the roles. Under prevention, you’ve got the provider. The provider will be someone who helps to meet the needs of someone in the community. Perhaps conflict is coming out of some unmet need. So that will be a provider. Teacher gives the skills that are needed to prevent conflict, and a bridge builder here would be forging relationships with other single connections can be made. So all three of those roles of course have to do with preventing conflict. Resolving it, we’ve got the mediator and arbitrator. Those roles sitting down and helping to actually reconcile. An equalizer is a little bit different. This is equalizing power. Is there a way that you could equalize power here. And then of course the healer can come and repair damage that has been done. So as you’re hearing these roles, you may think about your role, your skills, what you might bring to a situation, how you might step into any of these roles to prevent or resolve. And of course there’s containment– the witness. The witness is someone who can see what is happening in a neighborhood, or anywhere for that matter, and try to prevent further escalation. Then we have the referee who sets limits. And a peacekeeper, and the peacekeeper, of course, is going to be protecting going forward. Or protecting even if conflict is already happening. So those are the 10 roles. Now how can you identify these roles, and how does it actually work? And of course, it depends on the nature of the conflict, the stage that it’s at in terms of what roles might be most relevant. I’m thinking of an example that actually happened out in Billings, Montana, in 1993. And it actually started a movement called “Not in our Town”. The Ku Klux Klan had come to town and had begun to distribute fliers. They desecrated the Jewish cemetery, they threw a brick through the window of a six-year-old boy because he had a menorah in the window for Hanukkah, and they painted swastikas on the home of a Native American family. So their activities– their violence– was beginning to escalate. Well the town stood up against this. And here’s some of the actions that they took. Some of the roles they played in response to this violence. The police chief, who of course was witnessing the escalation here, urged citizens to get involved. Made it public what was happening and urged citizens to get involved. The church’s religious denominations forged bridges among themselves and reached out to a variety of denominations to have marches and to hold candlelight vigils. The local painter’s union came together to paint over all the racist graffiti, including the swastikas on the home of the Native American family. The local label council said no more of this, and they passed a resolution against racism, anti-semitism, and homophobia. So they set limits here. And then– which I think was just a wonderful attribute here– the local newspaper printed full page menorahs, and 10,000 of them were displayed in homes and businesses around town. So they made an unmistakable declaration that this was not going to happen in their town. And you can see the variety of roles that different members– different people– took. Religious organizations, police chief, labor union, painter’s union, the newspaper to contain this violence and to repair it. And of course to prevent it from ever happening again. So that’s one example of how, at this stage of a conflict, the community stepped in. The emergent will of the community transformed the conflict and stopped it. So you can use these roles, whatever role is appropriate, at any stage of conflict. If you’re in a school and you see bullying in the halls, or you see the beginnings of some sort of unrest, is there a way that you could move in to prevent? Help meet some needs as a provider? Perhaps bring in a program to give students some skills. Be a bridge builder, and forge some connections that might be helpful in preventing further escalation of a conflict. So these are roles that we are all urged to think about stepping into as part of the Third Side because we all are affected by conflict when it happens around us, and our communities, our homes, our organizations. So thank you for joining me today, and I look forward to next time. No Replies to "Identifying the Third Side in a Conflict and Making It Relevant to Parties"